The Socialist spoke to Socialist Party member Sandra Fay, a secondary school teacher in Tallaght and an activist in the Association of Secondary Teachers, Ireland (ASTI). 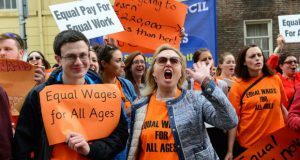 She spoke about the next steps for teachers’ quest for pay equality after the ASTI and Irish National Teachers’ Organisations (INTO) rejected a bogus offer from the government last year. “These rejections on the part of members happened despite the lack of a recommendation by the union leaders. It was clear that the appetite was not there among the officials to lead a fight to finally end two tier pay. “Knowing the offer was bad they could not recommend it. Instead they hoped that with the lack of a clear lead one way or the other teachers would conclude for themselves that it was the best deal possible in the circumstances and reluctantly accept it. “Instead the lead had to come from below. The lead in fact came from young teachers in the INTO, victims of the two tier pay system, who ran a spirited campaign for rejection among their colleagues. “Against all expectations the INTO membership rejected the deal. 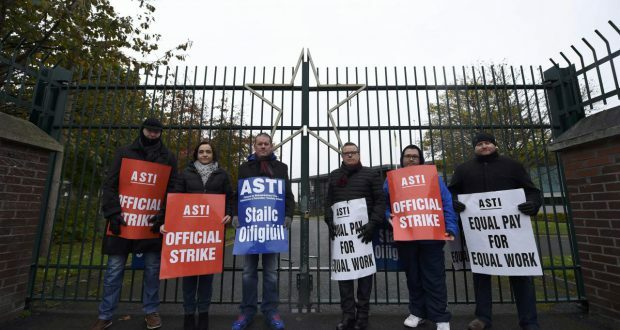 Fortunately, the ASTI ballot came after the INTO one and that union’s rejection had a big effect on ASTI members. It was the talk of all the staff rooms. “That said, momentum has been lost since those rejections. The unions should have immediately moved to ballot for strike action. No word yet has reached ASTI members about plans for a ballot. The INTO leadership are not going to consider a ballot until their next executive on 7th February! “There is massive annoyance amongst members. Most of the secondary teaching jobs that have become available are in the Dublin area and the rents are simply beyond the means of newly qualified teachers. The unions should be fighting not just for pay equality and restoration but also for cost of living increases. “The campaign of strike action announced by the nursing unions is being watched closely. There is massive sympathy and solidarity for their stand. 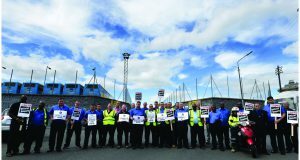 The treats to their increments and the other partial pay restoration measures from the government to bully them out of their strike campaign is very familiar to ASTI members. The feeling among many of our members is that we should be out with them at the same time. “Initiatives need to be taken by the rank and file activist groups in the teachers’ unions, Glór (INTO), TUI Grassroots and ASTI Fightback to put pressure on our union executives to proceed with the ballots so we can join the nurses.